We've seen some renewed life in the Phillies in the past week, the Phils managed to win 3 walk-off games in a row and nearly made it a fourth time last night against the Diamondbacks as they tied the game up in the bottom of the 9th again, but didn't have enough gas in the tank to win it then, they lost in 18 innings to the Diamondbacks 12-7. What has changed with this Phillies team in the past week since Ryne Sandberg has taken over for Charlie Manuel is that they have come to life a lot more. The moribund performances and the keystone cops act on the field has not shown itself as much as it was for a lot of this season. Chase Utley seemed to step up his leadership of this team a little more, and that's exactly what the Phillies needed. Last night's game with the Dbacks was a mind numbing 7 hours and 6 minutes, a new record for the Phillies in overall game length. Despite ending up losing this game, the Phillies battled on and even had to throw Casper Wells onto the mound and John McDonald also before the night was over. A true epic battle, and today it's Roy Halladay making a hasty return to the mound with the long Phillies game last night, the Phils used everyone they had. 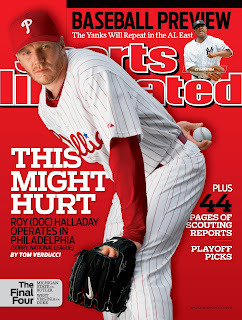 Phillies pitcher Roy Halladay will not make his previously scheduled Major League rehab start with the #Fightins today at 1:35 p.m.
Roy Halladay was supposed to start in Reading today but the big club needs his services more, so it's bye-bye Reading and hello Philadelphia for Halladay! Here on twitter, the Reading Phillies apologize to the fans that were expecting to see Halladay start for them.